Even the “day-of” wedding coordinator has the term “day-of” in it, it does not mean this professional will only work on your wedding day. Known more to complete “the coordination of the day of the wedding,” a day-of wedding coordinator often starts with a comprehensive consultation, at least four to five weeks prior to the wedding, to determine a timeline and what work needs to be done to ensure everything you dreamed of comes together as planned. In some cases, depending on the wedding venue you choose, you may be forced to hire a coordinator, at a minimum, depending on the venue’s guidelines. The cost of a “day-of” wedding coordinator, not to be confused with a wedding planner, will depend on the professional you hire, their expertise, your demands, the size of the wedding and the geographical location. As there are quite a few variables, the average day-of wedding coordinator, from the research we compiled, seemed to range anywhere from as little as $500 to more than $2,200+ for just the day. However, we did find that some couples were able to receive more than day-of services as some professional planners were willing to commit a few weeks up to the day-of the actual wedding. On this WeddingWire.com forum thread, for instance, one bride-to-be asked what a day-of coordinator would cost, and according to the responses, one member said she received quotes in the $1,500 to $2,500 in New Jersey, while another said she was able to hire hers for $500. According to BridalGuide.com, the average day-of coordinator can range anywhere from $800 to $2,600 depending on the geographical region, the professional’s experience and the exact specifics. For instance, where will the ceremony and reception be held? At the same place? Are there extra details that weddings do not often include such as a midnight snack bar? How long will the celebration last? As the website indicates, these are all factors to consider which greatly affect the total costs. Prior to the wedding, at least five weeks ahead of time, he or she will create a timeline, up to the day of the wedding to ensure the venue is set up as planned. If you’re working with a wedding planner at this time, they will help coordinate with them as well. They can even offer advice, vendor recommendations and collect contracts. Again, if you’re working with a wedding planner, then they will also help coordinator all of the wedding professionals for the day, either with the planner or the bride and groom. They will coordinate and help conduct the wedding rehearsal the day prior to the wedding to make sure everything is in working order. lastly, collecting all personal items, gifts and helping clean up at the end of the day. Usually, the day-of coordinator will be the last person to leave the wedding. The average day-of coordinator will spend a specific amount of time, usually dictated by their contract, to help prepare for your wedding day. According to OntheBridesSide.com, the average DOC will spend about 15 to 20 hours preparing for your special day. As part of this time, it will include calls/emails, offering vendor advice if you need it, finalizing your timeline, contacting the vendors and sending out all of the appropriate information. On the day of the wedding, their travel time and the time spent at the wedding will all be part of the time they committed to your wedding. How can you find one? First, start with your venue to see if they have a professional they recommend. By working with someone who is familiar with the venue, this can assure you that you’re working with someone who knows the venue inside and out. If the venue doesn’t know of somebody, then start with a few vendors you may have talked with already. 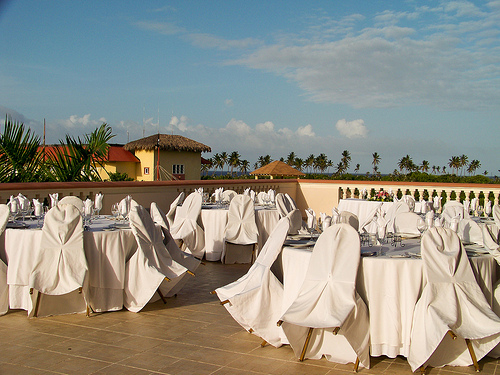 In some cases, they may be able to recommend someone who may be able to work with your venue. Lastly, if all else fails, search online, using popular review websites such as Yelp or even a simple Google search. According to the Huffington Post, a day-of coordinator usually will not work with last-minute details unless you pay an additional fee. This could include hiring a photographer last minute or finding a caterer, usually within 30 days, but in some cases, a professional may, but again, it could be extra. Be sure to confirm how many hours, at a minimum, they are willing ot commit to your wedding, and if they go over this allocated amount, what will they charge as an overtime fee? Ask about previous clients they have worked with, and if possible, see if you can talk with the couple to see what they have to say about the services. It also doesn’t hurt to know how many weddings they have worked with in the past. The more experience, as with any professionals, the more comfortable you can be with the selection. Go with your gut and feel the vibe. While it isn’t a “question” per se, you’re going to want somebody as committed and excited as you are. If your gut points to yes, then it’s wise to continue. Find someone who is willing to listen. See if they are strictly a day-of coordinator or if they offer packages which include much more than this. If you’re budget is tight, a day-of coordinator could be a great option, especially if they are willing to do more than just help on the day of the event.